In the last days before her death, Nel called her sister. Jules didn’t pick up the phone, ignoring her plea for help. Now Nel is dead. They say she jumped. And Jules has been dragged back to the one place she hoped she had escaped for good, to care for the teenage girl her sister left behind. But Jules is afraid. So afraid. Of her long-buried memories, of the old Mill House, of knowing that Nel would never have jumped. And most of all she’s afraid of the water, and the place they call the Drowning Pool . . . I wanted to like this book, I really did. I tried to so hard to just redeem itself but…no dice. I couldn’t get into this book no matter how hard I tried. There were too many characters introduced and not in a way that helped the book move along, I felt lost most of the time and I just couldn’t keep it together. I really wished I could though because it seemed like a cool premise to a decent mystery book. With it being a book I didn’t much enjoy, and couldn’t follow really well, I’m not sure there’s much else to say so unfortunately, this review is pretty short lived. ARC of this book was sent to me by the publisher in exchange for an honest review. This is my favorite book from Ruth Ware so far. I loved The Lying Game so much more than The Woman in Cabin 10 and In a Dark, Dark Wood. I loved the plot, the writing, and the pace of The Lying Game so much. I thought the plot was the most original of Ruth’s books and it really stood out to me. The writing in The Lying Game is fantastic. The pace is a slow burn (if you’re into fast paced thrillers, this one probably isn’t for you) but I was very entertained and it kept me reading on to find out what was going to happen. Even though I didn’t love the characters, I liked them so much more than the characters in Ruth’s other books. I thought they were more relatable and complex. I was expecting a bigger end to this book. I was hoping it would really pick up the pace and have a big boom for an ending but it didn’t. The Lying Game was kind of predictable but for me, it was more about reading how everything would unfold. 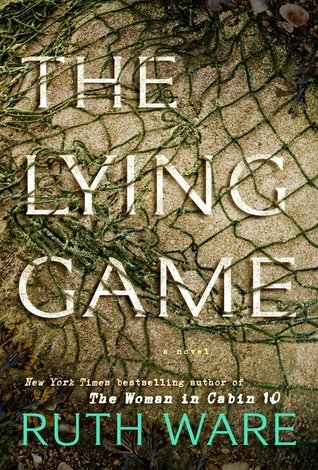 Overall, this is my favorite book from Ruth Ware and if you’re wanting a fun mystery/thriller, The Lying Game is a book you’ll want to check out. Harry Dresden — Wizard Lost items found. Paranormal Investigations. Consulting. Advice. Reasonable Rates. No Love Potions, Endless Purses, or Other Entertainment. Harry Dresden is the best at what he does. Well, technically, he’s the only at what he does. So when the Chicago P.D. has a case that transcends mortal creativity or capability, they come to him for answers. For the “everyday” world is actually full of strange and magical things — and most of them don’t play well with humans. That’s where Harry comes in. Takes a wizard to catch a — well, whatever. There’s just one problem. Business, to put it mildly, stinks. So when the police bring him in to consult on a grisly double murder committed with black magic, Harry’s seeing dollar signs. But where there’s black magic, there’s a black mage behind it. And now that mage knows Harry’s name. And that’s when things start to get… interesting. Magic. It can get a guy killed. I listened to this on audiobook as suggested by my boyfriend. He said that this was an absolute amazing series to listen to and that the narrator just brought Dresden to life. Mind you, I started geeking out when I found out the narrator was none other than James Marsters who is Spike from Buffy. So we were already off to a good start with this book. I have to say it was a bit intimidating to dive into and it was a first person POV for the book, which wasn’t a complaint but something I didn’t expect for a book like this. I enjoyed Harry as a character, he was pretty funny, a bit sassy and innovated at times. The world wasn’t too bad, your general gritty Chicago areas. And a not so bad start to what I hear is an epic series. I most definitely didn’t expect the bad person to be who they were which was AWESOME because I usually figure things like that out ASAP and in this book that didn’t happen which made me even more pleased. Some of this book seemed like it was just babble and filler for what was really going on but most of it was a page turner and I enjoyed that (ok well for me I’d get to my destinations and just sit in my car listening not wanting to stop). I can’t wait to keep going with the series.